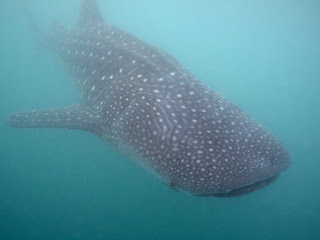 One Dumb Travel Bum: Whale Shark Bowling! The large pack of snorkelers swam frantically, trying to keep up with the enormous whale shark cruising slowly beneath them. Unbeknownst to them, several more boats were maneuvering ahead of the pack, ready to drop their own payloads. Bombs away! Two more packs of snorkelers dropped ahead of the scrum, and much to my amusement, I saw what was coming. The 20 snorkelers, heads down and swimming frantically, had no idea that another mob was swimming right at them, also with heads down, swimming frantically. 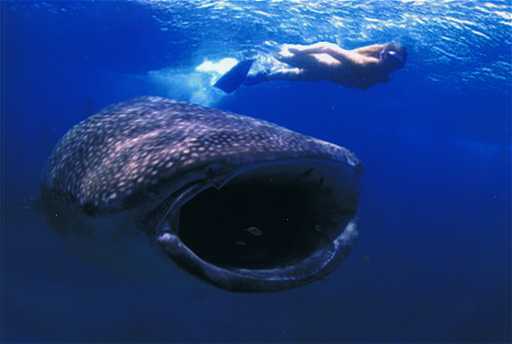 I watched the water explode with loose fins, masks askew, heads popping up like gophers as the groups collided head on. It was a strike! Ahhh, whale shark bowling was great. Whale sharks are amazing creatures, and they had remained an elusive unmarked notch in the belt of my short scuba diving career. I knew that even snorkeling with them was well worth the painful journey to the small town of Donsol in the southern tip of Luzon. A flight, followed by a long uncomfortable van ride through the curvy hills, stacked like sardines with locals puking on all sides, then a stint at cheap hotel, followed by an early morning over-priced tricycle ride, and then I was there. I met up with a few other Westerners and soon we had the necessary 6-person quorum to hire a boat. But first we had to watch the most comical video in the history of educational videos. The video went on about the majesty of the whale shark, then showed how only 1 boat was allowed per whale-shark, and only 6 swimmers. Each was to maintain proper distance from the shark. Extra distance was required for the large powerful tail. We hopped in our boat, and immediately headed toward a large pack of 10 boats surrounding a poor hapless shark. I suppose at least everyone was getting their money's worth. We got dropped in and the mosh pit approached. The captain yelled, "Its coming! Dive!" The ocean was milky white from the thick crush of plankton. Suddenly, a dark massive shape approached, and then it appeared. Its mouth opened wide enough to swallow me, I quickly swam out of the way. Incredible!! I swam quickly, hitting slower swimmers with my fins. It was eat or be eaten out here. I barely kept up with the shark, most fell behind quickly. It was unconcerned, apparently used to the commotion surrounding it. I dove down and saw it looking back at me. I thought back on that connection I'd made to those curious dolphins in Costa Rica. But there was none of that here, this was just a big dumb fish. Disappointed, I looked over its long spotted body, complete with interesting ridges along its length. Two parasitic fish swam just ahead of the mouth, looking for scraps. It was so big and the water was so thick with plankton I couldn't even see all of it. I slowed enough to let it start to pass. The huge dorsal fin came into view, and then the tail, lazily swishing back and forth. It was a big docile monster, no bark, no bite. I wanted to bring him home as pet. But first I knew I would have to ask Mom. and they offer backlinks to people who require such. with your site (or contents which are your secure text messages of choice) and point it to your site. For more info about Article Spinner Software Free Download visit this blog http://www.fottoshot.com/index.php?do=/profile-60188/info/ to gather more info. niches by assessing the strength of competition and search volume. As a result, a user can figure out whether a specific niche pays then utilize the keyword to rank their website page high in the online search engine. the more most likely it is to generate website traffic and resulting sales. Visit this domain for more info related to Keyword Tracking Tool.